We found seats at a bar all the way on the top floor. 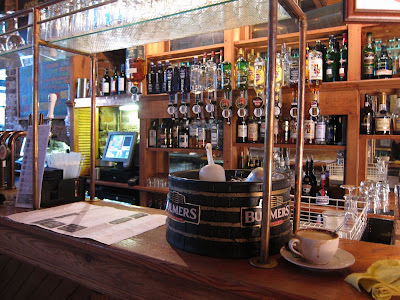 I promptly ordered a glass of their oyster stout. 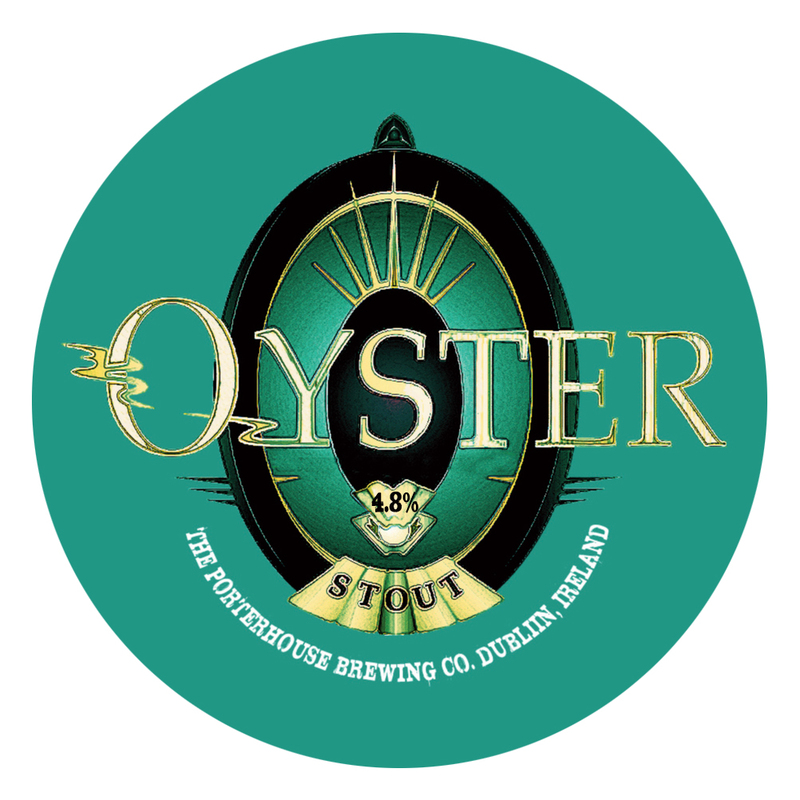 That's right, stout made with real oysters! This could easily have been another wild concoction dreamed up by the breweries, but actually they have time-tested roots that go back more than a century to Victorian England. Apparently, it was common those days to pair oysters on the half-shell with stout. The bitter-sweet toasty flavours of stout complimented the briny, juicy mollusks very well. For a while, the term 'oyster stout' referred to this pairing of food and drink. 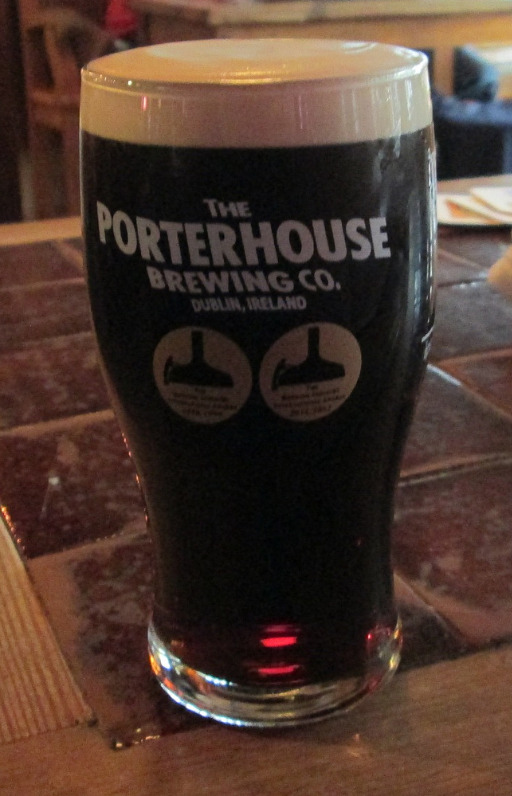 How it came to become part of the beer is an interesting but relatively more obscure story. At some point, some brewery discovered that oyster shells actually could be used as a clarifying agent for beer. At an even later date, some began experimenting with the addition of the fleshy oyster itself and the oyster stout was born. 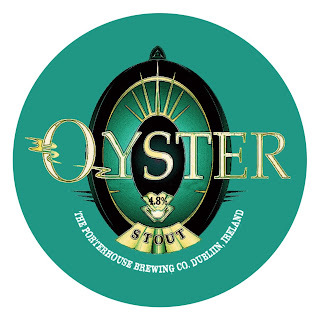 At this time, while oyster stout is available at some select breweries in New Zealand and even California, Porterhouse in Dublin is known to serve one of their most popular varieties on tap. I ordered an Irish Stew, having heard rave reviews from those who have tasted the Porterhouse version of this traditional dish. 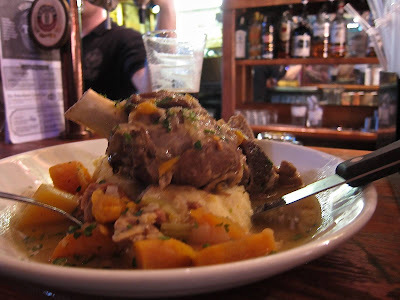 The Irish Stew at the Porterhouse is made of tender lamb chunks braised in Porterhouse Red Ale with onions, carrots, turnips, pearl barley and potato and topped with a braised lamb shank. This dish is served with a side of brown soda bread, another uniquely Irish staple. As you can see, I was so focused on my food and drink, I didn't quite get a picture that does justice to this fantastic dish. 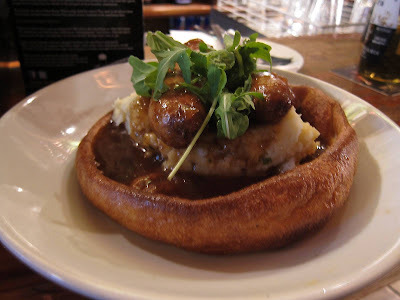 My colleague and local tour guide had ordered another delicious looking dish: Bangers and Mash, made of pork and leek bangers (sausages) over mashed potatoes with Porterhouse Red Ale onion gravy and served over a large Yorkshire pudding. By the time we got done with our food, it was dark outside. All floors were packed now with locals and tourists as we wove our way down the wooden stairs. Traditional Irish tavern music played on as we exited. 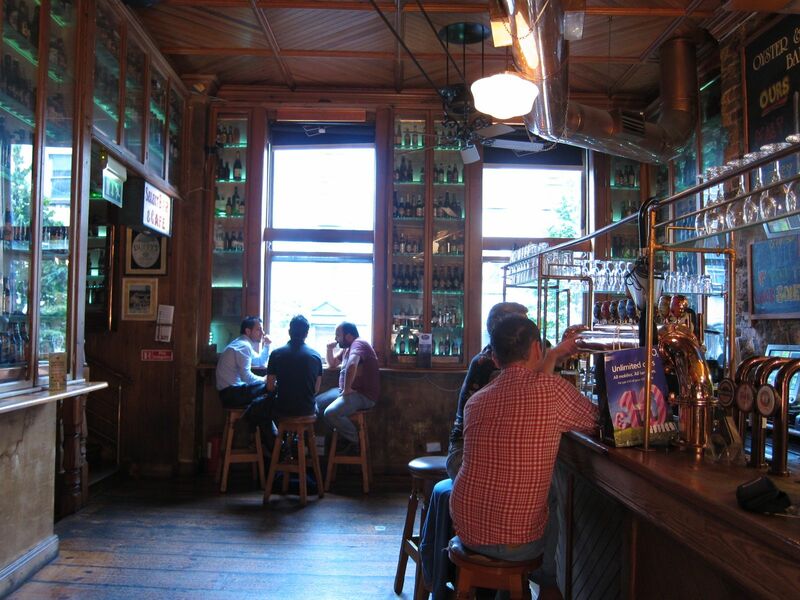 I didn't have as much time as I would have wished, but I am glad I selected this place over others to sample the local pub scene.